After Computers and Writing 2014, I’m thinking a lot about how composers sometimes purposefully leave it up to their audience to make meanings–something that was especially driven home when I saw Dan Anderson perform this piece live. In that spirit, I’m going to focus on the things I saw and heard at the conference and leave it at that. Saw: new rules for the C’s the Day card game. Heard: Oh, are you waiting for the Pullman shuttle too? Heard: When we first moved here, my husband wanted to run through the grass. He thought it would be all soft. Heard: Abigal Lambke‘s strong argument in A10 for attention to monomodal composition, like sonic essays that exist only in sound and no other modality. Bonus: she’s a killer teacher; I want to use some of her assignments. Heard: more conversations about 90s music than I’d heard for years. I still don’t know how much I was making these conversations happen, or if they just happened to circulate around me, like a sonic tornado. But surely it’s not just a coincidence that on one night, Tim Lockridge tries to remind me how amazing STP’s Purple is, and then the next day Wendi Sierra puts on her grunge station on Pandora, which manages to play like every song from the album. Sigh . . . 90s music. Heard: some karaoke for the ages, including Iron Maiden, Lisa Loeb, Phil Collins, Bon Jovi, Kris Kross, Goo Goo Dolls, and Boyz II Men. Best backup singers ever. Saw and Heard: the Pittsburgh power team’s presentation Archiving the Future: Three Material In(ter)ventions (F4), one of the best of the conference. Kerry Banazek discussed HDR photography, bringing up the question of to what extent material recordings replicate reality. Erin Anderson tricked us into believing we were hearing a conversation between a couple and their therapist, only to discover that neither person had ever met–Erin had digitally manipulated the conversation. (It’s the “age of the splice,” she said, quoting Stanyek and Piekut.) Trisha Campbell shared her murder archive with us, fully disclosing the possible ethical problems, “tricking” the voices into speaking in this space, and “tricking” us into listening, and thus becoming complicit in our own way. Wow. Thought: What would it look like to have a #riskyscholar performance/presentation during each session time at future Computers and Writing conferences? Ones where the presenters are sharing/speaking/making/meaning but not necessarily in ways that are interpreted the same way by everyone in the room. Verging on art. And if we’re not making art–I at least at this moment want to say, even if I don’t know if I mean it all the time–if we’re not making art, why are we making at all? I’m serious. In 75 minutes, I heard those sounds. Heard: lots of goodbyes from new and old friends, whom I never know if I should hug or not. 6. I don’t think I ate any other cake at the entire conference, except for that cake. @dradambanks is a poet. Futurists and time travelers welcomed to #4c14 opening session. 9. In a paper on Afrofuturism (the panel I mentioned above in #2, but in a talk by Earl Brooks, who was filling in for a speaker who couldn’t be there), we watched the video for Janelle Monáe’s “Tightrope.” The song was in my head just about nonstop after that moment. It’s that good. Then today, I saw her whole ArchAndroid album for $3.99 on Amazon. I bought it. 10. I’m watching Star Wars, kind of, while I type this. Luke just said, “I’m going to finish cleaning those droids,” and then there’s the suns and the music and your heart. 11. The first two times I went to C’s (2007 & 2009), I felt a little awkward, a little out of place. By my third time (2010), I realized I was making friends. This time (my 7th) was friend-tastic: I got to reconnect with a friend from undergrad, friends and professors from graduate school, lots of folks whose work I love, and even a friend who went to my graduate school the year after I left. As an introvert, I kept expecting to get sick of all the friend time and need more recharging time. And yeah, I got exhausted some. But mostly, I ate up the friend-time; it was the highlight of the trip. Like cake that’s so good you drive for five hours just to eat it. 12. 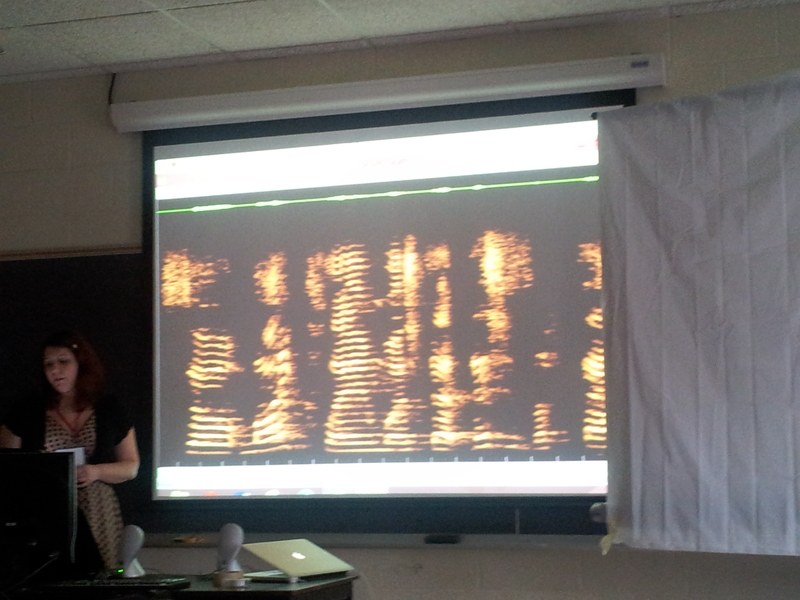 Michelle Comstock (in M.21) proved herself to be a sonic boom of a teacher, with her soundscape documentary and sonic memoir projects. I want to take her classes and teach her classes and live a while in her classes. 14. I had a good time playing C’s the Day, the augmented reality game at the conference. Since I won (in 2011, maybe? ), I always tell myself I won’t play. But then I can’t help completing a few quests, getting a few stamps, collecting a few cards. There’s something satisfying about the sound of the stamp, that subtle almost-squish of a thump as the ink soaks into the booklet. 16. In the same panel, Amy Riordan’s equally powerful presentation was threatened by dysfunctional speakers. Luckily, sound scholar Jon Stone had some in his backpack. 17. Oh no: Luke just found Uncle Owen and Aunt Beru’s burnt bodies. I never noticed the skeletons as a child, somehow. 18. Alliteration: “Repetition of the same letter or sound within nearby words. Most often, repeated initial consonants” (via). 19. In notes from CCCC in 2012, I wrote this during Geoffrey Sirc’s talk: “Our field has embraced an ethos of perfection, like music’s dual-side toward perfection or lo-fi, like Elliott Smith.” He might have said or it might be what he made me think of. @JennLStewart Perhaps it's clear by now that I'm bailing. Voice shot. If anyone sings Mariah Carey, think of me. 21. The funny thing about Mariah Carey is that I can’t tell how much I love her because of her music and how much I love her because of my memories of loving her music. 22. Cagle and I visited the Rhythm! Discovery Center, an interactive percussion museum. It’s delightful to hit things and hear them. I kept pausing to take pictures and record sounds, but part of me is thinking that it would have been even more fun if I had left my device at the door. Sounds are time-based, something you feel in the moment; isn’t there something odd to try to pause them, to capture them? 24. In notes from CCCC in 2011, I wrote that Geoffrey Sirc said the only textbook he needs when teaching writing is Richard Lanham’s Handlist of Rhetorical Terms. He said it as if it were obvious, as if everyone already knew that the definition of “good writing” is writing that is powerful, dynamic, full of rhetorical figures, as delightful as cake. 25. Others have blogged about the conference too. The ones I’ve seen so far: Chelsea A. Lonsdale, Steven D. Krause, Cruz Medina, Caitlin Martin, Christina M. LaVecchia, Crystal VanKooten. Tomorrow, I’ll be visiting (via Google Hangout) a workshop at Old Dominion University hosted by the inimitable Dan Richards and Sarah Spangler. The session is called “Public and ‘Private’ Social Media: Curating Your Academic/Professional Identity(ies) on Facebook and Twitter,” and my role is to talk about using Twitter at conferences. So I’ve been wondering: how do I use Twitter at conferences? Marketing may or may not be the right word, but the spirit is right: I wanted people to know, in advance, about the cool experience I was planning for them in my session. A conference program only goes so far, and it’s skimmed so quickly. Online, people see pictures and hear sounds they couldn’t otherwise get. There’s always someone at home watching the conference hashtag. When possible, I like inviting them explicitly into the events and ideas of the conference–and it always feels good to know when you got a shout-out. The back-channel is fueled by folks just plain noting what they’re hearing, which benefits 1) folks in other sessions who kind of wonder what’s going on in the session you’re in, 2) the presenter, who gets to read later on exactly what people took away, and 3) other folks in the same session, who may subtly disagree with or praise/appreciate your interpretations or summaries. Live, real-time conversations = my favorite. And, you know, whatever else comes to mind. Whatever comes to mind: share it! For accessibility purposes, it seems kind and ethical to provide a transcript for the hearing impaired–plus, it gives others the chance to catch what you said later on, meditate on it, and perhaps strike up a conversation (or a citation!) later on. But people might not know you went to the trouble to provide one unless they came to the session–or if you tweet about it. I have thoughts on staying organized for my #cwcon #grn table, but not as much on managing stress while on the job market. Any advice? As a table co-leader at the Graduate Research Network (where I met some new ODU friends!) I knew there was some degree of expectation that I, um, know things. But I don’t know all the things. So I asked for help. And people on Twitter want to answer you. Because it’s fun. And being fun is how you make friends. And, if I can add a cynical/practical angle: making friends at conferences is how you collaborate on future publications and make professional connections. You know that, though. @iamdan Q2: Is there a preferred way to get video on the #cwcon session pages? @jenlmichaels graciously filmed #k1 and I've got the files. When you go home, you’ll feel sad. But Twitter helps. You can continuing patting each other on the back, sharing resources, thanking each other, and being a genuinely good and nice person. Because you are. Right? Conference wrap-up posts are getting harder for me to write. I open my notes in Evernote, I open the Twitter feed in Tweetdeck, I open the conference website, and I sit there, looking for a theme, wondering what I’ll remember about this conference in five or fifteen years. I think I’m going to follow the style of my presentation, then: bounce from here to there as memories come, expecting my audience to fill meaning into the gaps. Because, you know, that’s what audiences do anyway. The week before the conference, a few of participated in an “online conference,” a series of daily discussions on the conference site and Twitter about the issue of the day. 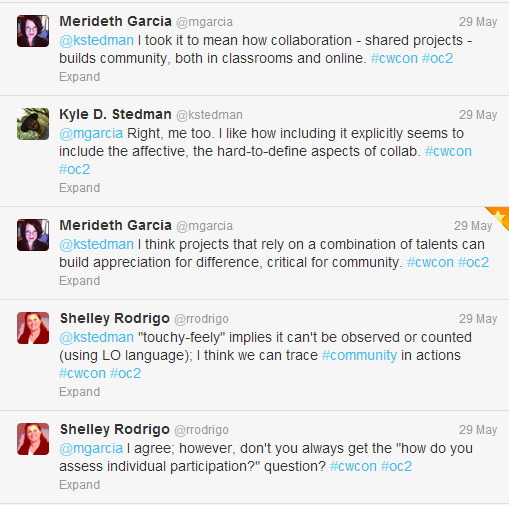 I'm trying to wrap my head around the #community part of #cwcon's #oc2. Does it always mean a touchy-feely sense of togetherness? What else? So I entered the conference itself wondering what community was and what it wasn’t, and when I “felt” like I was in community and how that applied to my teaching and scholarship. At dinner on Saturday night, Merideth and I talked about Star Trek films along with the other folks at our table. It didn’t take long to realize that we had a shared vocabulary, a sort of lingering underbelly of fannish community that we could rely on. It was nice. Partly, it was a favorite because of the content and delivery: Mary’s work on “sonic literacy” is in perfect harmony with my own work, and Jody’s video on “stealing sounds” was beautiful and enigmatic in just the way I like conference presentations/performances to be. But it was also a favorite when I looked around and saw the community of people who were there–all my favorite people, gathered to hear and discuss my favorite ideas, right there in that room, our bodies connected by the noises that erupted from our mouths and resonated into the cavernous space (swirling quickly and nearly silently through the cavity of the piano in the corner as if someone had tossed a bouncy ball into it). I mean, we’re a community, and we’re more of a community all the time. It’s fluid, in that it doesn’t have clear edges, and you can get in or out whenever you want. But we people who like sound and genre-bending presentations–we can look around and smile sly smiles, knowing that we fit together. At Karaoke on Friday night, the group coalesced the most, I think, when Nirvana’s “Smells Like Teen Spirit” came on. The strobe lights flashed, and I was suddenly in the community of my middle school dance, letting my 13-year-old awkwardness drift away as I head-banged and jumped around with the music, and I was also there at the Wild Things bar with my Computers and Writing community. Phil Sandick showed an evocative video of people practicing–of practicing practice, really. Alex Funt showed an evocative video of images of teachers in movies. Then @iamdan bursts into parodic song – "Risky scholar, qu'est que c'est?" omg, I ❤ #cwcon so, so much. I’m not sure, but it was also around then that Quinn Warnick reported that our #cwcon hashtag was trending on Twitter, making me wonder if the trending and the spam were related, if the textual output of our community was so big that it was leaking into the outside world in a material way with such force that even the spammers couldn’t ignore us any more. May we be so effectual in all our endeavors. Amen. 3 out of 4 of us got the crab cakes. We were glad we did. Kevin Brooks offered to give me a ride from BWI to Frostburg, giving me a chance to get to know him and two other scholars at North Dakota State University better (Matt Warner and Jessica Jorgenson). 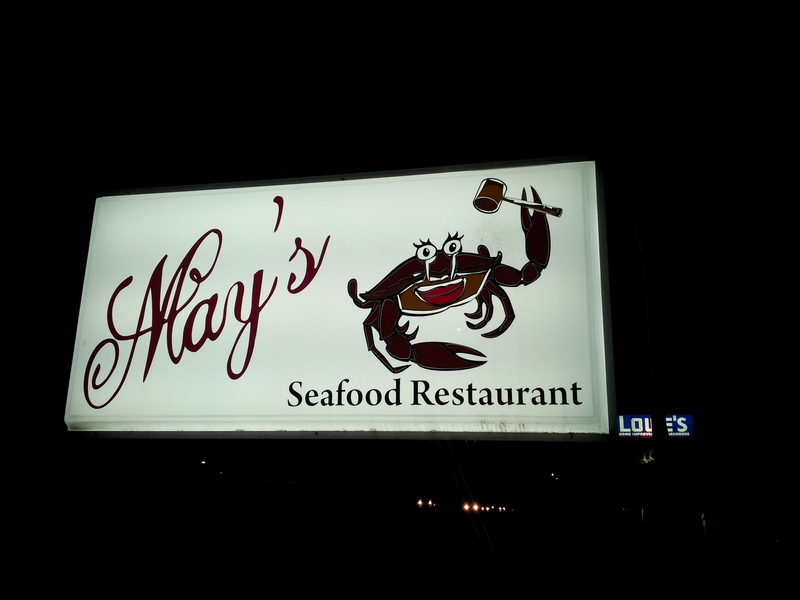 At Kevin’s suggestion, we stopped to eat in Frederick, MD, where we found a lovely hole in the wall called May’s. A different spin on community: I increasingly feel no guilt at choosing sessions that match my research and teaching interests over sessions where friends are presenting. I didn’t get to hear my good friend and collaborator from graduate school Quentin Vieregge because he was up against a panel on the rhetoric of sound, my main research area. I didn’t go hear my best conference buddy Jen Michaels because I’ve been wanting to learn more about accessibility issues and she was up against panel A9. And yet, when the panel I presented in with Tekla Hawkins and Bill Wolff and Amanda Wall (On the Digital Rhetorics of Fans and Fan Communities) was about to begin, there at the very end of the day on Sunday, I was definitely feeling all glowy at seeing the faces of friends and admired scholars fill in the space. All my favorites, there in a room, one last time. We had a good crowd, and that changes things, right? So community is built in spaces, both physical and digital. Except when it’s not. On the first day of the conference, I rode the crazy one-person “mountain coaster” at the Wisp Resort, careening through raindrops that exploded against my glasses like bugs, or like sounds. Each individual rides solo and is separated from the people ahead and behind by a good amount of space. That’s why, I suppose, I didn’t hear Jen yelling something at me, in the next car back, which she told me about afterward. It was probably something funny, but I missed it. I was alone, climbing the mountain, strapped into my odd little rail car. I was looking at the trees, the grass. Listening to the clanks of the coaster. It’s an inherently lonely experience, but in a good way. But of course, it’s not a lonely experience. Upon disembarking, everyone standing in the wet line wanted to know how it was, what happened, how to speed up and slow down. We gathered together immediately, naturally. So we gathered, making a circle of wet, smiling heads, anticipating the future and describing the past, nervously clutching our bags and smushing ourselves under too few umbrellas. I’d like to write a post summarizing the Computers and Writing conference. But right now, I’d rather live in the world of memory than summary. I want to think through the threads of uncertainty, time, and music that the conference brought to mind, which are so wrapped up in my ideas about memory. I’m Washington, DC right now, even though I just left a conference in Raleigh and live in Orlando. Yesterday, a friend picked me up in Raleigh and I drove her to DC, where she’s moving. Now, I’m in the old terminal at Reagan National Airport, waiting to fly home. I’ve lived in this space before. I remember reading C.S. Lewis’s The Great Divorce sitting in the same collection of seats, even though that was six years ago. I’ve only been in this city for seventeen hours, yet there is a pit of sadness in my belly over leaving. For my musical presentation at the conference, I played a video with my voice talking over some images (and occasional black screens), while I played records live as a musical accompaniment. My motif was the musical prank, the moment where an audience’s expectation for how music will sound is thwarted, complicating the idea that we identify with music and make meaning from it based on how our expectations are met or not met. To mess around with expectations in the audience, I changed the speed of the records, played them backwards, and played them along with video footage that they were never meant to accompany. But my expectations weren’t met, either. A piece of fuzz in my needle kept the records from sounding the way I expected. The weight balance of the needle arm was probably misbalanced, leading to more skips than I expected. My arm was shaking more than I expected, so I missed a couple of precise arm placements thad had worked fine when practicing at home. And just as when an audience is surprised, and thus is led to make meaning from the surprising sounds, I was surprised by what sounded, and I made my own meanings as well. 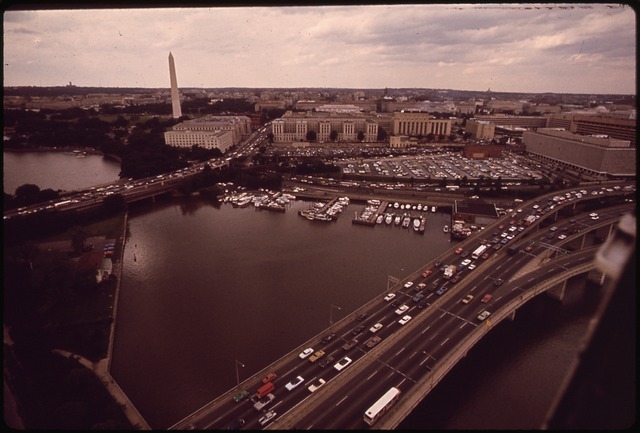 I asked my friend to drive me by my old neighborhood in Washington, DC, the Columbia Heights / Petworth area. Even when I left five years ago I knew the area was gentrifying, that the pedestrians were getting whiter and the stores were getting sleeker, bigger, more national. But I didn’t expect the difference in the feel of a space that is surrounded by new, tall condos instead of three-story townhouses. What used to be on that corner, I kept asking myself, where that tall, metal building is now? I’ve walked by that spot hundreds of times–how could I have forgotten? Anne Wysocki gave a keynote address introducing her long-term project on the rhetorical canon of memory. She’s designing a beautiful interactive web space that allows users to simulate a walk through the different ways people have engaged with memory over the last 2,500 years. It was lovely and important enough that I thought, I want to be involved in this project. I want to engage with memories from now on. I don’t want to forget. Much of Wysocki’s talk reminded me of a book by musicologist David Burrows called Time and the Warm Body. (At rhetoric/composition conferences of late, I find myself mentioning Burrows once a day, and twice on days I present.) I tweeted the book title to Wysocki as she spoke, just in case she hadn’t come across it. It’s Burrows’s consideration first of how our bodies experience time and the “now,” an experience of time that he situates as the epistemological nature of how we experience music, given our nature as embodied, time-based creatures. Language draws our minds to other spaces and other times, but music draws us to the now. Wysocki tweeted back, later, an earnestly cheerful reply that she didn’t know the book and was excited to look it up. It made me feel good, and it made me think about all the books the people in the room had read individually and all the books we had read collectively, as a massive library of memory that could never be perfectly tapped. Drinking with Trauman the next day, he mentioned that I have an earnestness about me. On the drive to DC, I told my friend that I always think of my wife as the earnest one, but that I liked the idea being earnest myself, too. I want to be earnest. I want to construct things, and engage with memories through my earnestness. At one point during the conference, I jokingly tweeted that the theme of Computers and Writing 2014 should be The Goonies. Scott Reed rewteeted it with an earnest “THIS –>” preeding my tweet. I could look up these tweets to make sure I’m quoting them correctly, relying on the exactness of a computer’s memory. But my memory is just fine, in this case, even if it’s not always accurate. I remember where I was when I read another David Burrows book, Sound, Speech, and Music: the waiting room of the Tire Kingdom near my house in Orlando. The coffee was bad, and the 24-hour news network on the loud TV was worse. I don’t remember what my car was in for that day. But I remember being surprised by Burrows’s prose, his theories of music and speech that included lines about psuedopods of meaning reaching between humans engaging and identifying with each other. And in my surprise, I found meaning. And in my meaning, I created memory. Before taking the Metro to the airport this morning, I met an old DC friend in Union Station. At first, I felt turned around: there is construction that blocked off the path I expected to take inside the building. And maybe it shouldn’t matter, but a net a few feet above my head blocked bits of my sight as I glanced up at the pounds and pounds of air between me and the distant windows near the ceiling. Even though I wasn’t walking vertically, the net made me feel even more disoriented. But the Corner Bakery was still there, and so was the bookstore (though it’s a Barnes and Noble now), and so was the line of people outside waiting for taxis, and so was the neverending construction outside the station. I’m not sure how I felt so comforted and discomforted at the same time, helped along by the con/destruction around me, and my confirmed and demolished memories. Jody Shipka presented on the process of archiving and remediating found texts as a way to remember and honor the people who created them. She has amassed an astounding collection of old photos, home movies, and slides from various yard sales and such. The clips she showed were comforting and discomforting, constructing and destructing (as some of the film she showed literally burned to pieces just after she digitized it). I tried to tweet during the talk but eventually had to stop, pulled to the now that Shipka drew to my attention with a beauty I didn’t expect. It was one of those wonderful presentations with ultra-small audiences that makes me feel I witnessed something rare. I responded that there was something lovely and important–and indeed, unexpected–in the physicality of the analog, the touch of a record. The quotations above aren’t exact. I remembered them that way. While waiting in the airport terminal a few minutes ago, a demolition project began outside. I watched out the window as a small, golf-cart-ish thing rammed into the concrete exterior wall of the terminal and shook with anger as it (I assume?) drilled cracks into the area marked for destruction. It looked like a small animal who was positive that it could knock over a skyscraper, if only it rammed and shook it hard enough. But the quality of the sound had none of the cute, unassuming nature of the vehicle’s appearance. It was like a giant with metal teeth was chewing concrete for breakfast, like a jackhammer underground was coming at a square of sidewalk from below and I happened to be standing on it, like a memory being forcibly removed from my head instead of being allowed to fade into smells and images and sounds in the gentle way they’re supposed to go. 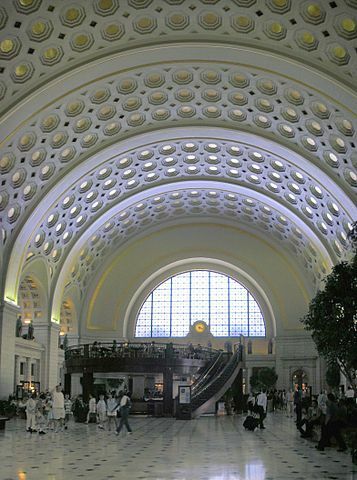 I moved to the other side of the circular terminal, but even there, it seemed just as loud. I couldn’t escape from it, regardless of how hard I tried, unless I wanted to leave security and come back in later. 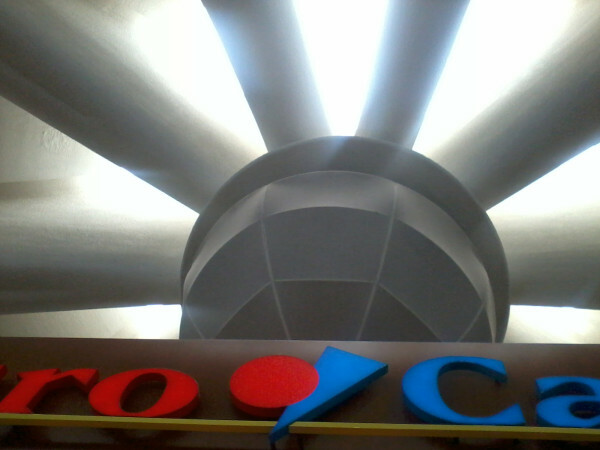 I looked up at the circular, 60s-ish ceiling of the old terminal and tried to focus on what I was seeing instead of what I was hearing. David Burrows, in Sound, Space, and Music, writes, “Noise is a concept rooted in the domain of sound rather than sight, because the promiscuity with which sound addresses itself to appropriate and inappropriate receptors alike means that we must so often hear things we do not want to hear, whereas we can look the other way, or close our eyes, when we see something unpleasant or superfluous. Our auditory defenselessness casts us often in the role of victim, our privacy invaded by someone else’s stereo or car horn” (24-25). I’m on the plane now, finishing this post in the loud, fuel-tinged air of the next-to-last seat in the cabin, so unlike the space in Union Station I wandered through so recently. I’m hoping for a good glimpse of the National Mall as I leave, even as I know I can hardly bear it. It’s that pain you get when you have braces and you bite down on your aching teeth, and it’s good and hard at the same time. Leaving the conference was cleaner, if more awkward. There were so many people I wanted to properly say goodbye to, who have begun to matter to both my professional and personal lives. But instead, I waved at the people I saw, hugged a couple, and slipped out the back door of the Syme Hall basement. This is an exciting CCCC for me: I have a solid presentation planned with solid colleagues in a solid slot (B, at 12:15 on Thursday), and I’m more excited about this year’s Intellectual Property Caucus than ever. Here’s why: Elizabeth Woodworth and I are co-leading a table at the IP Caucus on teaching with IP. But we were worried that we might come up with all these great ideas and then not put them into practice when we return home. So we decided to focus our energies on one pedagogical approach: storytelling. Can I just have the short version? I’m busy. Share your story of learning or teaching IP. Use the DALN to record and archive your story so others can read/hear/see it. Keep an eye on #ipstory for updates and links. Spread the word at your sessions–even if you only briefly draw attention to the #ipstory hashtag. What form will these stories take? We’re encouraging people to share their stories with the Digital Archive of Literacy Narratives, a stellar repository of stories about people’s experiences developing various literacies (including, we believe, IP literacies). We like the DALN because it already has the mechanisms in place to make adding metadata a snap and to allow story-tellers to choose how their stories may be used in the future. The stories can be composed of text, audio, or (our favorite) video. Best of all, submitting to the DALN is easy either from home or by dropping by their booth outside of Exhibit Hall 1 in America’s Convention Center at C’s. What kinds of stories do you want? Surprise us! But in general, we expect two basic directions: 1) narratives about learning IP issues–perhaps stories of being accused of plagiarism or copyright violation, of boldly exercising fair use rights, or of suspecting that your own intellectual property had been wrongly used–and 2) narratives about teaching these issues to students, including informal explanations of pedagogies. Here’s a perfect example that’s already available in the DALN (though it wasn’t recorded as part of this #ipstory initiative): http://daln.osu.edu/handle/2374.DALN/1279 The composer of the narrative tells a story about being accused of plagiarism in the 4th grade and how it affected her. It’s short, informal, and memorable. You can also check out IP Stories from Kyle and Elizabeth below or through other sites (Kyle’s at YouTube or DALN and Elizabeth’s at Vimeo or DALN). How will people access all this stuff? Exciting stuff, eh? I think so. Please post suggestions on how to teach with IP Stories at this Google Doc. Thanks!